Wuhan is located on the banks of the Yangtze River, the second longest river in the world, and Hanshui, the main tributary of the Yangtze. 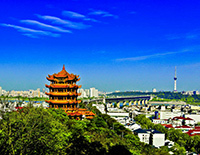 It is divided into three parts that converge at the Wuhan Yangtze River Bridge: Wuchang, Hankou, and Hanyang. There are three other bridges across the Hanshui River that link the city as well. Therefore, it has the nick-name, "City on Rivers". The top attractions in Wuhan like Yellow Crane Tower, Hubei Provincial Museum, Guiyuan Temple and Wuhan Yangtze River Bridge present you ancient history and thriving present of Wuhan. Extend to the Taoist mountain - Wudang Mountain and practice Taichi and meditation with Taoist priests. As a harhor city, you could also take Yangtze River cruise from Wuhan. Catch our best Wuhan tour packages right now and all can be tailored for you. Features: In our 2 days essential Wuhan city tour, you will visit the must-sees scenic spots in Wuhan, such as Guiyuan Temple, Yellow Crane Tower, Hubei Provincial Museum and East Lake. Features: Taking D-train from Yichang to Wuhan to get into this historical city by visiting Guiyuan Temple, Yellow Crane Tower, Hubei Provincial Museum, you will be attracted by Wuhan's deep culture. Features: 6 Days Wuhan City Tour with Yangtze Cruise will take you to tour wuhan city to see Yellow Crane Tower; cruise along Yangtze River and make excursion to the natural and cultural sites overland, and more activities, which will leave you great impression. 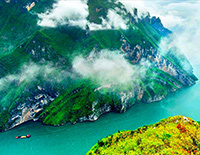 Get better understanding about China Yangtze River by taking an upsrteam cruise from Yichang to Chongqing and visiting well-known museums to know more history and culture; have in-depth exploration in Hubei Province by extending to Wudang Mountain, the UNESCO World Cultural Heritage Site. All highlights of Hubei & Yangtze are offered in the 10 days trip from Wuhan. 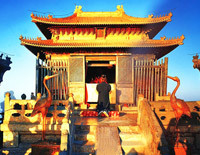 From north to south, this tour selects the best highlights of China. You will be amazed at the Great Wall in Beijing and Terracotta Warriors in Xian, linger over the stunning views of Yangtze River, wondered by the karst landscape everywhere around Guilin and enjoy the sparkling nightlife of Shanghai. Along the way is full of surprises! In the 17 days, visit the ancient hearts - Beijing & Xian; spend some happy hours with the cute panda bears in Chengdu; reach mountain city to start your memorable Yangtze cruise; visit the world-famous project Three Gorges Dam; climb Yellow Crane Tower to have a panoramic view of Wuhan; enjoy yourself in the picturesque Guilin & Yangshuo; finally, see the modern China in Shanghai.